It’s no secret that the iPhone is a highly attractive target platform for developers, not only because of the excellent app distribution model that Apple has put in place with the App Store, but also because of the quality and accessibility of its freely-available development tools. They are great tools, indeed, but we wouldn’t go as far as to say you could get a game out the door in a single day, or anything. Well, at least…we wouldn’t have, until developers Alex Schwartz (who brought us Spring Fling) and Yilmaz Kiymaz (who brought us Rocket Monkey) did just that. Schwartz and Kiymaz decided to try and develop a full-featured iPhone game, including all of the art, animation, music, sound effects, and everything, all within a single day — 24 hours. And before the starting pistol fired, the duo opened up the design to the iPhone gaming community. After amassing ideas from the community, the timer started and the code began to flow. The team live-blogged the entire process in a thread in our own forums (which they’ve since summarized on their own blog). And did they succeed in their mission? Well, despite delivering the game one entire minute late (we’ll cut the guys some slack…), we’d definitely call the effort an impressive success. With the help of the online Touch Arcade community for ideas (forum member Sailor Jensen provided the winning concept) and a few developers from the Boston indie community for assistance with art and music (Matt Board, Beth Beinke, Steve Trenkamp), Super Ramen BROTHers quickly sprang to life, and is now available as a free App Store download [link]. And what’s this hastily wrought title all about? Well, you control both of the Ramen brothers as they flee down the cashier’s conveyor belt in an effort to avoid that laser scanning thing and, ultimately, two cups of boiling, stovetop death. 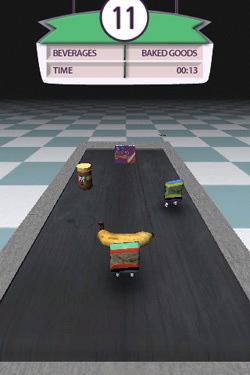 In their flight, down the three-lane conveyor belt, they must jump or dodge (tap or drag) other grocery items, as every collision jolts the Ramen packs back one notch closer to doom. 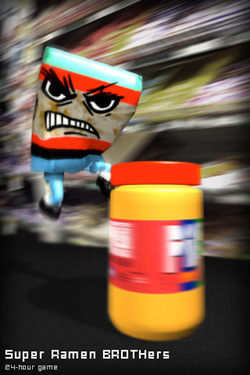 Soy sauce packets picked up along the way help the Ramen brothers edge back forward towards freedom. AGON community integration provides leaderboard tracking — an impressive touch for a one-day app. See the devs’ video for a look at the gameplay. Super Ramen BROTHers is certainly not the best iPhone game we’ve ever played. But then, that wasn’t really the point. Hats off to all involved in showing that it doesn’t necessarily take a year of your life to get an iPhone game to the App Store. Surely their efforts here will inspire a number of would-be iPhone developers to give it a shake. What’s more, the game is actually pretty fun to play. Give it a try.